Definition at line 105 of file packet_id.h. Definition at line 114 of file packet_id.h. Definition at line 61 of file packet_id.h. Referenced by packet_id_write(), reliable_ack_write(), and reliable_mark_active_outgoing(). Definition at line 67 of file packet_id.h. Definition at line 104 of file packet_id.h. Referenced by add_option(), and packet_id_init(). Definition at line 113 of file packet_id.h. Definition at line 103 of file packet_id.h. Definition at line 112 of file packet_id.h. Definition at line 64 of file packet_id.h. Referenced by packet_id_read(), protocol_dump(), reliable_ack_print(), reliable_ack_read(), and reliable_ack_read_packet_id(). Definition at line 70 of file packet_id.h. Definition at line 95 of file packet_id.h. Referenced by packet_id_net_print(), packet_id_persist_print(), protocol_dump(), reliable_ack_acknowledge_packet_id(), reliable_ack_print(), reliable_ack_read_packet_id(), reliable_ack_write(), reliable_mark_active_incoming(), reliable_mark_active_outgoing(), reliable_mark_deleted(), reliable_not_replay(), reliable_print_ids(), reliable_send(), reliable_send_purge(), and reliable_wont_break_sequentiality(). Definition at line 50 of file packet_id.h. Definition at line 58 of file packet_id.h. Definition at line 123 of file packet_id.h. Definition at line 51 of file packet_id.h. Definition at line 96 of file packet_id.h. Definition at line 49 of file packet_id.h. Definition at line 317 of file packet_id.h. Definition at line 115 of file packet_id.c. References CIRC_LIST_ITEM, CIRC_LIST_PUSH, CIRC_LIST_RESET, CIRC_LIST_SIZE, get_random(), packet_id_rec::id, packet_id_net::id, now, packet_id_rec::seq_backtrack, SEQ_EXPIRED, packet_id_rec::seq_list, SEQ_UNSEEN, packet_id_rec::time, and packet_id_net::time. Referenced by crypto_check_replay(), and packet_id_persist_print(). Definition at line 311 of file packet_id.h. Definition at line 101 of file packet_id.c. References CLEAR, D_PID_DEBUG, dmsg, free, packet_id::rec, and packet_id_rec::seq_list. Referenced by do_close_packet_id(), key_state_free(), packet_id_persist_print(), test_crypto_thread(), and tls_wrap_free(). Definition at line 78 of file packet_id.c. References ASSERT, CIRC_LIST_ALLOC, CLEAR, D_PID_DEBUG, dmsg, packet_id_rec::initialized, MAX_SEQ_BACKTRACK, MAX_TIME_BACKTRACK, MIN_SEQ_BACKTRACK, MIN_TIME_BACKTRACK, packet_id_rec::name, packet_id::rec, packet_id_rec::seq_backtrack, packet_id_rec::seq_list, packet_id_rec::time_backtrack, and packet_id_rec::unit. Referenced by do_init_crypto_static(), key_state_init(), packet_id_persist_print(), test_tls_crypt_setup(), and tls_session_init(). Definition at line 274 of file packet_id.h. Referenced by openvpn_decrypt_aead(), openvpn_decrypt_v1(), openvpn_encrypt_aead(), openvpn_encrypt_v1(), tls_crypt_unwrap(), tls_crypt_wrap(), and tls_wrap_free(). Definition at line 391 of file packet_id.c. References alloc_buf_gc(), BSTR, buf_printf(), packet_id_net::id, packet_id_format, packet_id_net::time, and time_string(). Referenced by crypto_check_replay(), packet_id_persist_save_obj(), and protocol_dump(). Definition at line 419 of file packet_id.c. References D_PID_PERSIST, packet_id_persist::fd, packet_id_persist::filename, M_ERRNO, msg, packet_id_persist_enabled(), and packet_id_persist_init(). Definition at line 281 of file packet_id.h. Referenced by check_packet_id_persist_flush(), packet_id_persist_close(), packet_id_persist_load(), packet_id_persist_load_obj(), packet_id_persist_print(), packet_id_persist_save(), and packet_id_persist_save_obj(). Definition at line 409 of file packet_id.c. References packet_id_persist::fd, packet_id_persist::filename, packet_id_persist::id, packet_id_persist::id_last_written, packet_id_persist::time, and packet_id_persist::time_last_written. Definition at line 433 of file packet_id.c. References D_PID_PERSIST, D_PID_PERSIST_DEBUG, dmsg, packet_id_persist::fd, packet_id_persist::filename, gc_free(), gc_new(), packet_id_persist::id, packet_id_persist_file_image::id, packet_id_persist::id_last_written, M_ERR, M_ERRNO, msg, O_BINARY, packet_id_persist_enabled(), packet_id_persist_print(), platform_open(), read, S_IRUSR, S_IWUSR, ssize_t, packet_id_persist::time, packet_id_persist_file_image::time, and packet_id_persist::time_last_written. Definition at line 524 of file packet_id.c. References packet_id_rec::id, packet_id_persist::id, packet_id_persist_enabled(), packet_id::rec, packet_id_rec::time, and packet_id_persist::time. Referenced by do_init_crypto_static(), and tls_session_init(). Definition at line 534 of file packet_id.c. References alloc_buf_gc(), BSTR, buf_printf(), CIRC_LIST_ITEM, CLEAR, buffer::data, gc_free(), gc_new(), packet_id_rec::id, packet_id_persist::id, packet_id_send::id, packet_id_net::id, packet_id_rec::initialized, packet_id_rec::last_reap, packet_id_rec::max_backtrack_stat, msg, packet_id_rec::name, now, packet_id_add(), packet_id_debug_print(), packet_id_format, packet_id_free(), packet_id_init(), packet_id_persist_enabled(), packet_id_reap_test(), packet_id_test(), packet_id::rec, packet_id::send, packet_id_rec::seq_backtrack, SEQ_EXPIRED, packet_id_rec::seq_list, SEQ_UNSEEN, packet_id_rec::time, packet_id_persist::time, packet_id_net::time, packet_id_rec::time_backtrack, time_string(), packet_id_rec::unit, and update_time(). Referenced by packet_id_persist_load(), and packet_id_persist_save(). Definition at line 482 of file packet_id.c. References D_PID_PERSIST, D_PID_PERSIST_DEBUG, dmsg, packet_id_persist::fd, packet_id_persist::filename, gc_free(), gc_new(), packet_id_persist::id, packet_id_persist_file_image::id, packet_id_persist::id_last_written, M_ERRNO, msg, packet_id_persist_enabled(), packet_id_persist_print(), ssize_t, packet_id_persist::time, packet_id_persist_file_image::time, packet_id_persist::time_last_written, and write. Referenced by check_packet_id_persist_flush(), and do_close_packet_id(). Definition at line 288 of file packet_id.h. References packet_id_rec::id, packet_id_persist::id, packet_id_net_print(), packet_id_persist_enabled(), packet_id::rec, packet_id_rec::time, and packet_id_persist::time. Definition at line 301 of file packet_id.c. 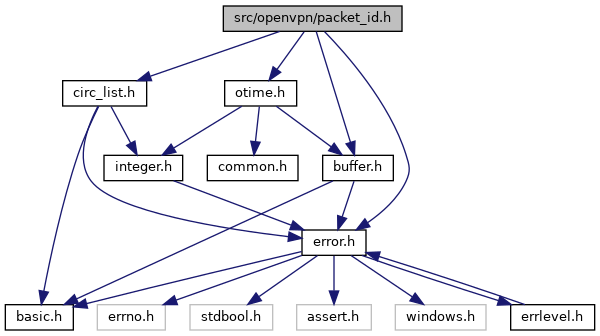 References buf_read(), packet_id_net::id, ntohpid, ntohtime, and packet_id_net::time. Referenced by openvpn_decrypt_aead(), openvpn_decrypt_v1(), protocol_dump(), and tls_crypt_unwrap(). Definition at line 170 of file packet_id.c. References CIRC_LIST_ITEM, CIRC_LIST_SIZE, packet_id_rec::last_reap, now, SEQ_EXPIRED, packet_id_rec::seq_list, and packet_id_rec::time_backtrack. Definition at line 334 of file packet_id.h. References packet_id_rec::last_reap, now, packet_id_reap(), and SEQ_REAP_INTERVAL. Definition at line 305 of file packet_id.h. Referenced by crypto_adjust_frame_parameters(), crypto_max_overhead(), swap_hmac(), and tls_crypt_buf_overhead(). Definition at line 202 of file packet_id.c. References ASSERT, CIRC_LIST_ITEM, CIRC_LIST_SIZE, D_PID_DEBUG, D_PID_DEBUG_LOW, D_PID_DEBUG_MEDIUM, packet_id_rec::id, packet_id_net::id, packet_id_rec::initialized, packet_id_rec::max_backtrack_stat, packet_id_debug(), packet_id_rec::seq_backtrack, packet_id_rec::seq_list, packet_id_rec::time, and packet_id_net::time. prepend If true, prepend to buffer, otherwise append. Definition at line 349 of file packet_id.c. References buf_write(), buf_write_prepend(), htonpid, htontime, packet_id_send::id, packet_id_send_update(), and packet_id_send::time. Referenced by openvpn_encrypt_aead(), openvpn_encrypt_v1(), test_packet_id_write_long(), test_packet_id_write_long_prepend(), test_packet_id_write_long_wrap(), test_packet_id_write_short(), test_packet_id_write_short_prepend(), test_packet_id_write_short_wrap(), and tls_crypt_wrap().